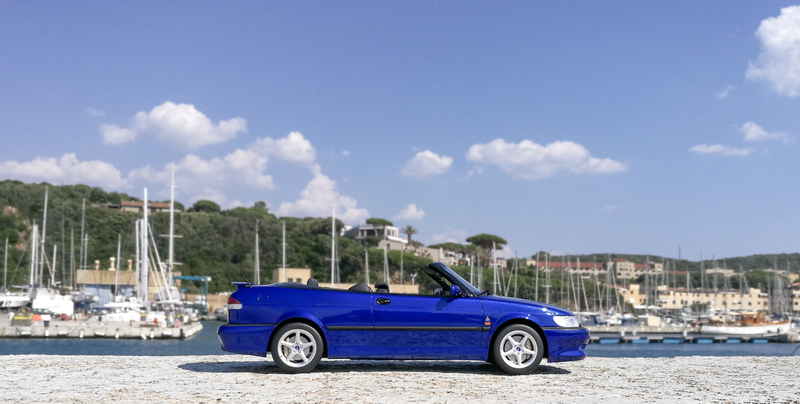 From all the multitude of models and manufacturers present today in our hobby area is relative simple to find a scale replica of your dream or personal car, even if this is a racing, supercar or a common one. 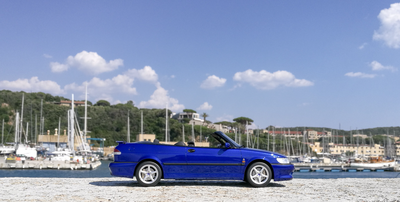 If most of the new manufacturers are choosing to enter in the game replicating big names of the car's history or cars with a notable pedigree, in many of cases already done before by someone else, others are trying to start with something totally different. 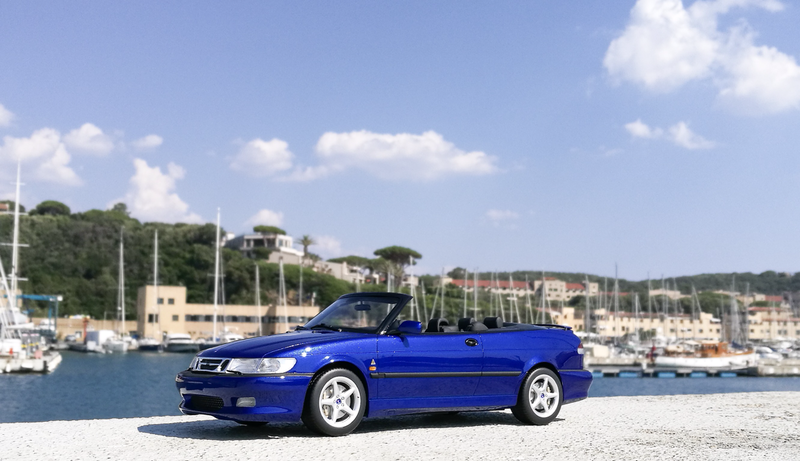 And this is the situation we have here, a new producer that announced his intention last year, to make his debut replicating a model of one of the uncommon brands in 1:18 scale: a SAAB model. 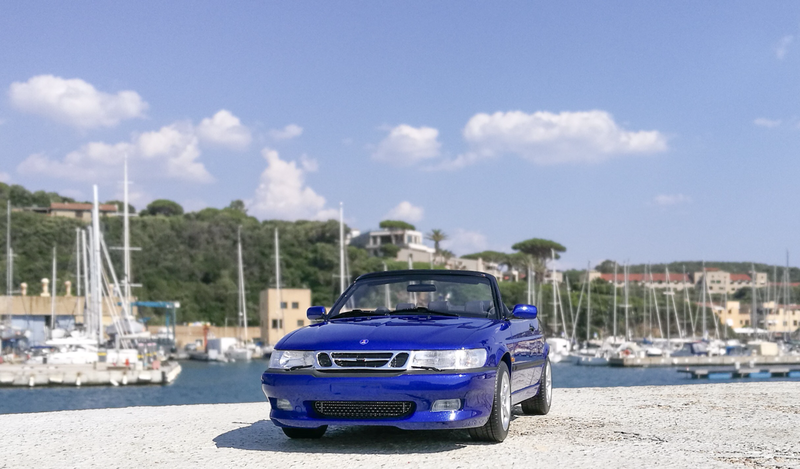 Could be already clear that someone there has a passion for this still missed car manufacturer for many of us and the chosen model will be something special, the SAAB 9-3 Viggen, for example. Thanks of this kind enthusiasts from DNA Collectibles-www.dnacollectibles.com- I have here today, fresh in his box or cloth bag, this new model ready to be reviewed. Yes, I said cloth bag, because this is the original way they present their model, a soft microfiber bag, keeping inside the traditional box and wearing a tag where they proudly announce that we just received an item for the adult collectors. Any girl around you, could be very tempted, because the package looks really good and fashionable, so be careful. From the first contact, the card box could appear too large for a 1:18 scale model , but the generous dimensions are justified, because inside, the model is surrounded by a foam protection shell. Someone there knows that every collector's nightmare is a model arrived in pieces due the transport risks and wanted to avoid this thing and I'm sure that every single buyer will highly appreciate this. The model is fixed on its base and can be removed from the box very easy, because the side protections are fixed to the card box. And is now that moment when you'll be amazed by the product inside, at least for me was a pleasant surprise to observe a different level of manufacturing. To be honest I was expected to see a model at the same standards as the middle range resin products on the market. But, now I can tell you this is something else. Let's speak about the original looking transparent base, never seen this in 1:18 scale, an original way to put better in evidence the model. 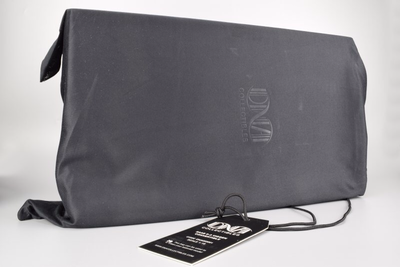 This can be removed from the base unscrewing the four screws underneath, after you'll remove the protection, yes, even the base was wrapped, because our friends from DNA collectibles want us to enjoy our new model in the perfect conditions . 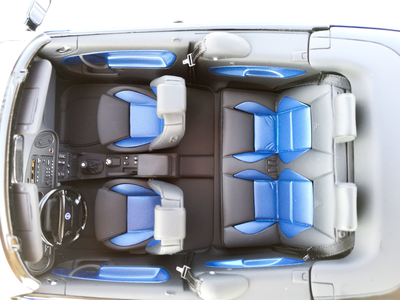 It wears the car indicative and was modeled to suits an eventual showcase. The model itself inspires quality and attention to every detail. I can't spot a single residue of glue anywhere, an usual problem for the resin made models or a single part that wasn't fixed carefully in its place. The paint is absolutely beautiful, and I speak here about both, shade and the paint job, is uniform, bright and the metallic flakes has the right size for this scale. I've seen this paint effect on few very expensive models, so this is an effort to be appreciated. In the same way, the chrome is perfect and the traditional Saab front grill looks amazing together with the car's lettering clear done and legible. 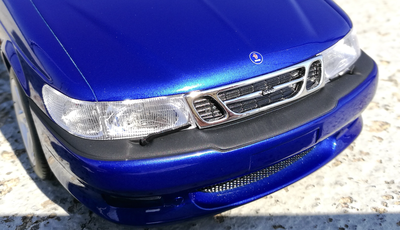 The grill behind it, isn't perforated, but this fact is quickly corrected by the other one, on the front spoiler that keeps the original design and is replicated by a metallic photo etched piece. Both, rear and front lights are exemplary done, the result is very realistic, if you'll take a carefully look, even the bulb inside is visible. 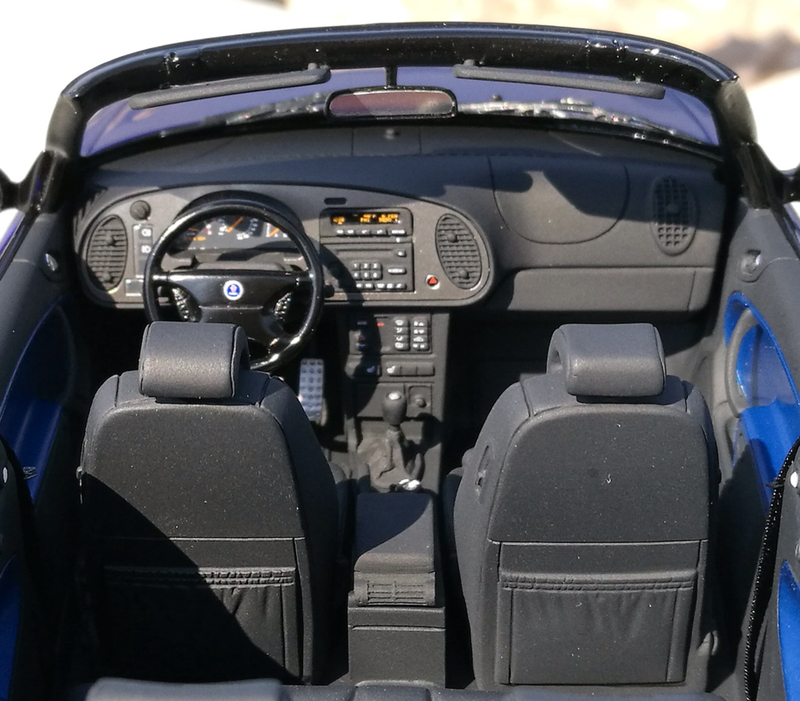 Very nice job here, but is something else that deserve to be mentioned, because I never seen it before: the plastic quality for the bumpers and for the interior pieces is remarkable. On the bumpers, the unpainted plastic keeps a great texture that reminds me the composite material used on the real cars and once again I can only appreciate how carefully they are fixed to the model, not a single drop of glue or any other residue of manufacturing being present. 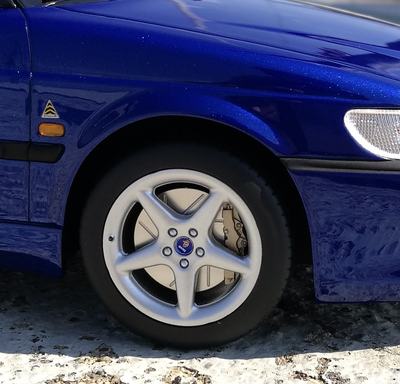 The car's badges are clearly done and well detailed with a plus for the Saab lettering on the rear side. I particularly like the front window frame and the way they finished it- some manufacturers have something to learn here. ​In the same way, the rims and the brake system behind them were replicated flawlessly, the Saab badge is present in the center and tires are keeping a true profile. The front wheels are not steering and not all four are easily rotating, so is better not to force them, to avoid eventually damages. Our model comes along with a detachable roof just to enjoy all the interior view better, can be removed without any effort and reveals a true to the real interior. I'll mention again the plastic quality and the way it is finished. Without exaggerate is in my top three of the best finished interiors ever seen on a model in this range. And I'll try to give you the reasons why: the plastic quality is excellent, all the pieces are crafted to perfection, from the seats to the smallest button, I could not find any gaps or mould's residues- I think is the first time and I can't stop remembering the experience had with one hypercar's model, few months back, all the buttons and indicators are marked and clearly legible, I don't know how they did it, but it looks great. That dash board looks stunning and is true to the real car, all the air vents are cut through, all the switches were moulded and for the steering wheel they used a shiny plastic that offers a great looking effect. The interior lacks the flocks, unfortunately, but offers fabric made seat belts for all the four seats with metallic photo etched buckles that are fantastic crafted. Underneath, not many things could be seen, except the chromed final exhaust pipe and some minimal chassis edges moulded on the base. I forgot to tell, this model is a part of a very limited series and the badge here, certify this. Is time to have some conclusions after this experience with the DNA's first release and I'm happy to say that is relative hard today to find a new model that fulfill my expectations. I can't find a single issue on this model, It surprised me with a high level of crafting and detailing, especially on the interior. This model was secured so well, so Is easy to understand how carefully they treat their products. After having contact with this model, the only feeling you have is that was made by a collector for other collector and if this was only the beginning, than DNA will have more to say in this hobby.